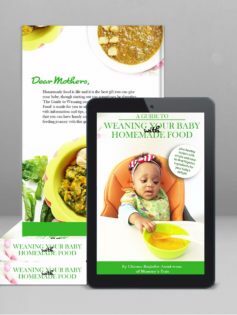 Get all the tips and information that will help you successfully get your baby to enjoy mealtime plus bonus recipes that will usher in a lifetime of enjoying Nigerian meals. The arrival of a baby is always a time of joy in the family but as the time for weaning draws near, many mothers are anxious about how to start and do this well. People will tell you different things about baby weaning that a times all the information flying left, right and centre can get too overwhelming for a new and especially first time mum. I have received tons of questions from mums asking different questions about weaning. I have always responded and received rewarding feedback, as well as rave reviews on the recipes that I have developed and shared on this website. 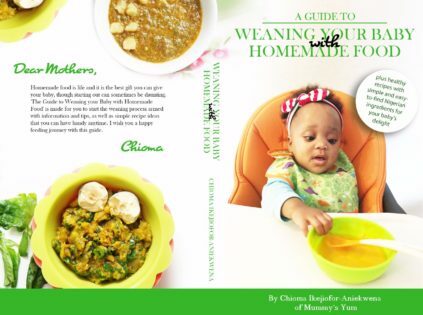 “A Guide to Weaning your Baby with Homemade Food” was inspired by those questions from mothers and the quest to get the right information across to many Nigerian Mums out there. It contains how to wean your baby right, as well as recipes that are made with simple ingredients right in your kitchen to help you establish a lifetime of healthy eating for your baby. Get this guide if you are expecting a baby, a new mum already or first time or you just want to get general knowledge about feeding a baby. School creche workers, minders and nannies are not left out, as it will help them feed children in their care well. Single ladies are not left because you will want to arm yourself with knowledge before babies start coming…I actually bought my first pregnancy book when I was single. You can also send this guide as a gift to a friend, sister or acquaintance who is a new mum or expecting (for bank transfers only). Get details when you click the ‘buy now’ button. The recipes I create on this website is always nutritiously loaded but simple, so you bet this book will be written in a simple and easy to understand language, same with the new recipes included. When you buy this book and start using and implementing all the information and recipes, you will not only be creating wholesome homemade meals for your baby but also saving your money for other things. The cost of this book is less than the amount you will spend buying commercial food that will last just a couple of weeks, so you are getting an amazing book at a bargain and giving your child the healthiest and best start in life. 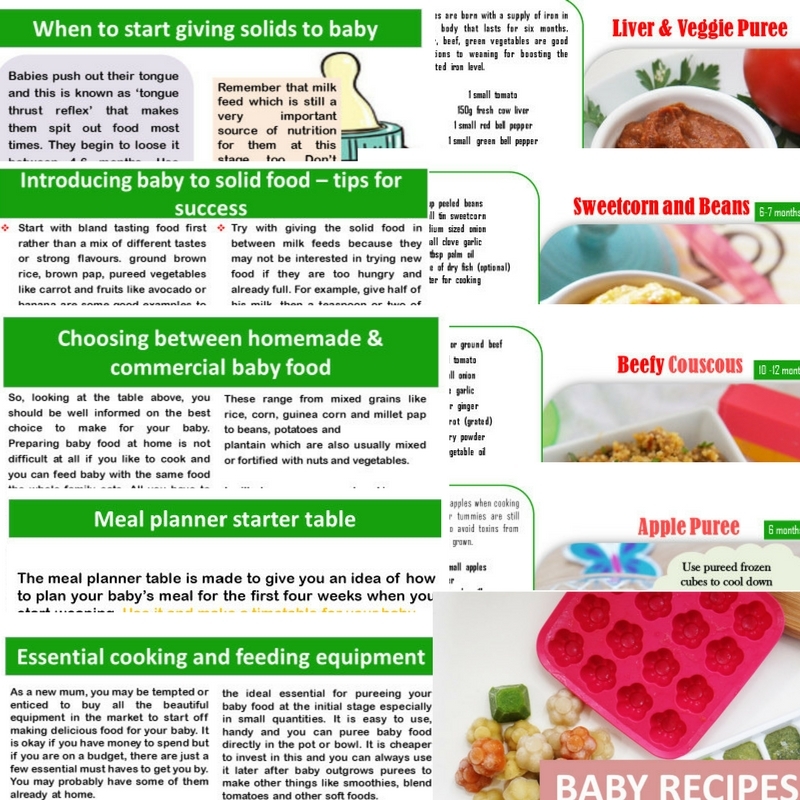 With “A Guide to Weaning your Baby with Homemade Food”, you will never be bothered about forgetting or losing it because it will be downloaded to your phone, tablet or laptop for you to easily browse through at your convenience, whether at home or on the go…yes, it is an eBook 😉 packed with the best information you can ever get. The size is very small that any smart device will not have a problem downloading it. I promise you 70 pages of awesomeness in this eBook GUIDE, which also includes more than 25 recipe combinations with ideas and substitutions that you can make for your baby starting from 6 months up to 12 months. Grab your copy now, join the MOMY group (you will get an id code to get access) and give your baby the best from Mummy’s Yum. 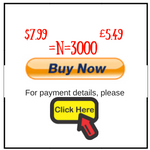 You can get it any where you are all over the world by clicking on any of the buttons. If you have any questions before making your purchase, please feel free to send me an email on chioma@mummysyum.com or drop a message by filling the form below.